Wedding pictures at Pietro’s on the River of Gregory and Thomas who had their tenth year anniversary on the day before their actual wedding! From the moment I had the pleasure of meeting these two gentlemen, I knew they were meant to be with each other. 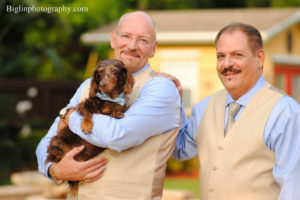 On the day of their wedding we met at their house in Port St. Lucie and took their wedding pictures with their furry ring bearer. 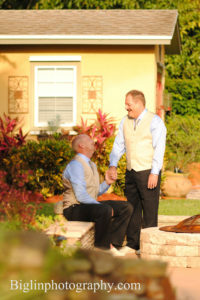 The grooms were picked up at their home by limousine and chauffered to the beautiful Pietro’s On The River in Jensen Beach. 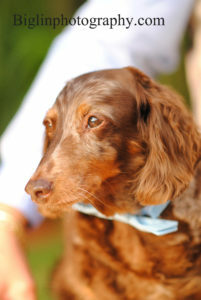 Their wedding ceremony took place under the gazebo over looking the river on an absolutely beautiful Saturday morning. The harpist was playing as the guests found their seating. No wedding party was needed to announce Gregory and Thomas. 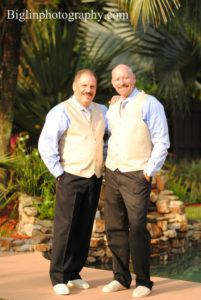 “A Time for Us” was playing as the two grooms walked down the isle hand in hand to a standing applause from their guests. It brought a tear to my eye that they were finally able to be together not only in the eyes of God, but the state as well. The Rev. Lee Ganim performed a memorable ceremony with both laughter and tears. The Apache Wedding blessing and a sand ceremony was among the highlights during the wedding ceremony. A receiving line was not planned but all their one hundred and ten guests were eager to congratulate the newlyweds. Inside the reception, all of the tables had wedding cakes as their center pieces. The grooms and their guests enjoyed an exquisite brunch followed by speeches and their first dance together as a married couple. When it came time to cut the cake Tommy asked a member from each table to cut the cake at the individual table. 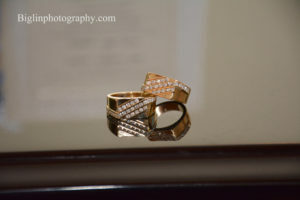 It was a wonderful way to bring people together and I absolutely loved every minute of this wedding. Mette Biglin has been shooting award winning photography service since 2005. You will not get a 2nd chance for wedding photos. Contact professional wedding photographer Mette Biglin for a complimentary consultation for your wedding day! Mette Biglin proprietor of I Do Photography is as professional photographer that photographs weddings, family, portraits, headshots, real estate and offers aerial video.